Assessment dominates our lives but its good intentions often produce negative consequences. An example that is central to this book is how current forms of assessment encourage shallow ‘for-the-test’ learning. It is true to say that as the volume of assessment increases, confidence in what it represents is diminishing. This book seeks to reclaim assessment as a constructive activity which can encourage deeper learning. To do this the purpose, and fitness-for–purpose, of assessments have to be clear. Stobart explains that these form the basis for the argument that we must generate assessments which, in turn, encourage deep and lifelong learning. 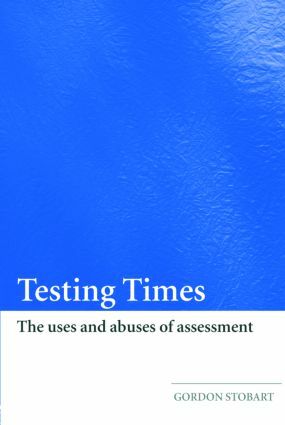 This book raises controversial questions about current uses of assessment and provides a framework for understanding them. It will be of great interest to teaching professionals involved in further study, and to academics and researchers in the field. What do IQ and ability tests really tell us? Does testing used for accountability undermine learning? This book argues that assessment shapes how we see ourselves and how we learn. At a time when people are labelled in terms of their ability, learning styles or achievement, the book takes a hard look at the rationale of these labels. It also shows how, in our test driven culture, assessment can often undermine effective learning by encouraging shallow ‘for-the-test’ learning and by treating test results as an end in themselves. The author explores how we can develop assessments which generate deeper learning and which can play a constructive role in creating our identities as people and learners. This accessible and provocative book will be of great interest to educational professionals, academics and researchers. Gordon Stobart is Professor in Education at the Institute of Education, University of London. He is editor of the international journal Assessment in Education and a member of the Assessment Reform Group.